Provide students a secure, integrated ePortfolio to create, organize, and present academic and co-curricular activities with instructors, peers, advisors, or anyone in the world; the need for instructors and advisors to to share feedback and assess student progress and achievements based on discipline specific requirements. 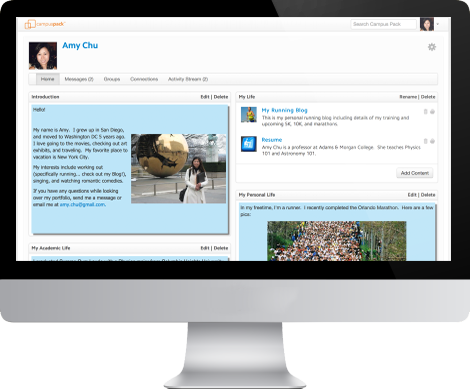 The Learning Objects ePortfolio Application provides individuals a space and network to create, organize, and publish academic and co-curricular achievements using social media content; instructors have the ability to provide feedback and students are able to maintain their work after their time at the institution. Publish and push content to popular sites including Facebook, Twitter, etc.